The flat side design makes possible a tight wobble and wiggle action, to appeal even on a straight retrieve. 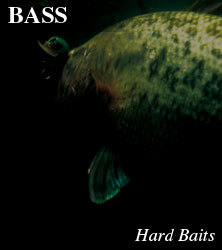 On the stop it flutters to give bass time to strike. It is made for tough conditions like deep divers should be. With the slightest pull the specially designed lip digs into the water to get down deep even on dead slow retrieves it can bump along the bottom against structure enticing inactive bass to take the bait. Choose between the "REGULAR" or "JUST WAKASAGI" size based upon the prevalent bait fish. When all the pieces fall in place LAYDOWN MINNOW will give you an experience you will never forget.